The main function of language is interaction and communication. Therefore, our approach to teaching is based on the communicative method, the efficiency of which is proved by leading experts in foreign language teaching. All kinds of courses offered by our Centre involve classroom studies with a teacher based on the communicative method and focused on a particular student. Thus, the key teaching principle in our Centre is a client-oriented approach, i.e. teaching arrangement with maximal consideration of individual peculiarities, needs and interests of students. 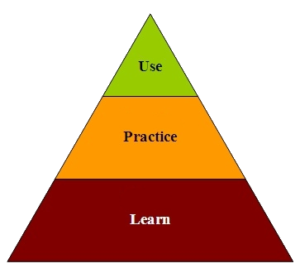 Three basic components – LEARN, TRAIN and USE – are expressed in a carefully selected system of exercises for classroom work and in engaging additional methods of activation and the use of knowledge and the skills obtained, such as reading at home, watching films and TV programs in a foreign language, and informal meetings in a conversation club.